How we treat our fellow man. An introduction from Rosie Branson Gill. A hatful of thank yous for a great event to 18 Reasons and Bi-Rite. Thanks in particular to Rosie for being willing to share her thoughts that night and for letting us share them here! Happy Martin Luther King, Jr Day! I say that earnestly and with intention, not superficially – just another series of words that should roll of the tongue, so it does. I bring up today’s holiday because tonight’s event with Ari Weinzweig, for me, evokes one of the fundamental tenets of Dr. King’s life work: how we treat our fellow man. However, do you notice – health insurance, fair wages, maternity leave: these are still all “things,” quantitative just like the number of miles your food travels before it gets in your mouth. And, all of these quantifiable things are still somewhat malleable. Like any business decision, there is room for negotiation. There is one aspect of sustainability, however, that I think is immutable, so fundamental to the term and the lifestyle the term engenders that if we get it wrong, then we might as well have built castles out of sand. It is not a thing, or measurable only by numbers. It the same aspect of Mr. King’s work that I find inspiring – how we treat one another. We must make treating each other well a priority. Yes, that includes health insurance, but it also includes genuine concern for more ephemeral aspects of life – how someone’s day is going; how a work environment affects a person; that they are fed well, well-trained, empowered, and nourished. Generosity, grace, gratitude – these are qualities that any sustainable business must engender – in its employees, in its mission statement, in its guests, in its vendors. What is great about this, is that we have control over those things. Weather, policy, and lobbyists – we cannot control them so easily. But we can control how we act towards one another. And in reading Ari’s book I learned about a man and a business that infuses, intentionally, their culture with kindness towards and concern for people. I also appreciate how pragmatic Ari is and how honest. He, too, rolled his eyes when first asked to do “touch-feely” business exercises, but he was strong enough and open minded enough to see that when something is genuine, then it simply cannot be touchy feely. It is just good. Look, I am from Boston. We’re a little tougher on the east coast. We don’t say “hellah rad, dude”, for christ’s sake, we say “wicked pissah”. I cringe at the touchy-feely, mostly because I don’t often find it sincere. However, in Ari’s book, at Bi-Rite, and I am sure at Zingerman’s, the wisdom of putting people first is evident. The proof is in the pudding, and in the numbers – two metaphors that are applicable with this audience. Ari – it is a pleasure to welcome someone so thoroughly invested in creating a better world and proving that the health of a business and the people it touches can not only co-exist but are the same thing. I was making plans for lunch the other day and I got to thinking about the Cheddar Dream Sandwich that’s in the Cheddar Cheese chapter in Zingerman’s Guide to Good Eating. For those of you who are not (yet) familiar with this weekend favorite, it’s a grilled cheese sandwich–made with french toast! Well, I had the fixings. There was Zingerman’s Bakehouse White on the counter, 2-year Grafton Cheddar in the fridge, some great Harnois Farms local eggs I’d just picked up, and… bacon. Bacon? Well, it’s not in the recipe for the Cheddar Dream Sandwich, but why not add some bacon to the fun and fry the sandwich in bacon fat instead of butter?! Why not indeed. In a large skillet, cook the bacon over medium heat until crisp. Meanwhile, beat together the eggs, milk and salt. When the bacon is done to your liking, remove it from the pan, leaving the bacon fat. If you like your bacon a little on the crispy side, leave it in the pan while you’re frying the bread. Dip a side of 2 of the bread slices into the batter and place batter-side-down in the skillet. Top each with half of the cheese. Dip one side of the remaining 2 slices in the batter and place atop each sandwich, batter-side-up. 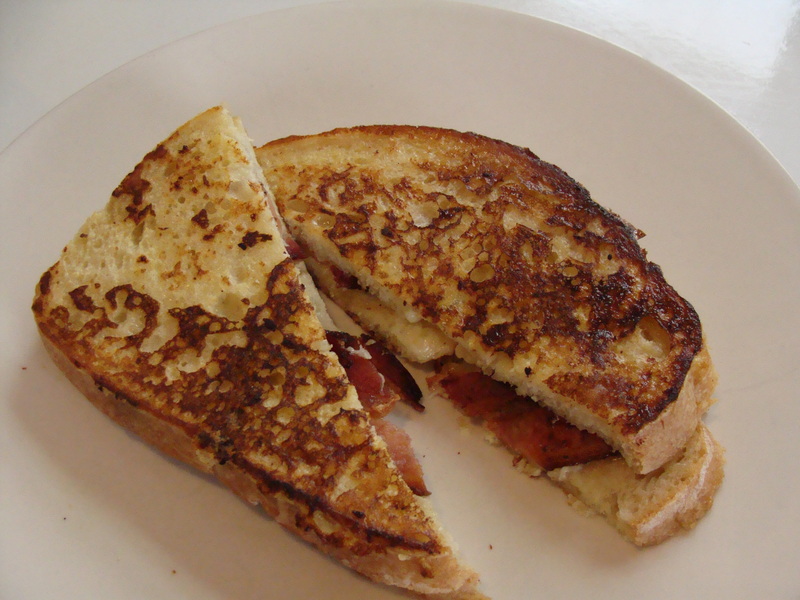 When the bottom slices are golden brown, about 3 to 4 minutes, carefully flip the sandwiches over, using a spatula. Cook until the second side of each sandwich is golden brown, another 2 to 3 minutes, and remove from the skillet to a warm plate. You can put 2 strips of the bacon right inside each sandwich or service it on the side. Top with a generous drizzle of maple syrup.